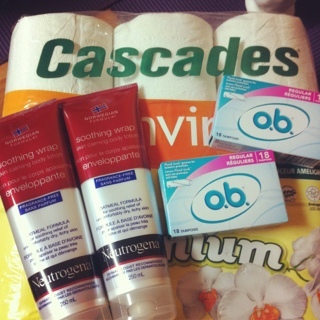 Can I just say I REALLY REALLY love London Drugs. The staff there is so amazing and friendly and helpful and the deals – WOW. Wish I had of started shopping there years ago… also wish I had of started couponing sooner – but don’t we all. Super excited for today’s sore – the toilet paper was whatever, I only have two rolls left and don’t want to run out. Gonna try and get some at Shoppers Drug Mart on their Sunday/Monday deals. Anyway on to today. I couldn’t find the right free gift with purchase. The coupon for the FREE Neutrogena Norwegian Formula Soothing Wrap Body Lotion was in front of the wrong-but-almost the same product so I made the mistake at first of trying to buy it. Everyone was really nice in helping me find the right product – turns out it was at the customer service desk because it is not something they keep in stock! phew, I thought maybe they had run out already. Anyway they found it for me. What a deal on it’s own, buy $2.99 tampons and get a free $10 body lotion? To top it off I had a $2.00 off coupon for the O.B. making them $0.99! The lotions are perfect for my Mom and Grandma’s stocking! This entry was posted in canadian coupons, coupon stacking, coupons, deals, free, free gift, freebies, london drugs and tagged canadian coupons, coupons, free, free gift, freebies, london drugs on December 9, 2011 by Courtnie.